The first events in the 2015 Borders Sport and Leisure Triathlon Series will take place in Galashiels this weekend and feature a Come & Tri event – a shorter course perfect for novice competitors on Saturday – with a sprint triathlon on Sunday. The Come and Tri Triathlon course comprises a 400m swim, 10.88km cycle and 2.33km run, and starts at 1pm, while the sprint triathlon features a 750m swim (at Galashiels Pool), a 19.14km cycle (which includes a challenging climb over the Windyknowe onto the A72) and a 4.66km run through the Gala policies. Sunday’s event has a 10am start. The series, which features events in six Borders towns between April and September, has been growing in popularity year on year, with a number of this year’s fixtures almost fully subscribed already. On Saturday, the club hosted the 13th Scottish Spring Target Shoot at their home field of Thirladean, by kind permission of Sir Michael Strang-Steel. After a week of calm, sunny weather with warm, gentle breezes, the weather gods decided to throw a challenge at the competing archers. Like last year, the wind was challenging, gusting to 40mph and blowing over several targets. One end for the gents was even scored with the target lying face up, several feet from its stand. This, along with conditions alternating between sleet, hail, snow and brilliant sunshine, set the archers an even harder challenge than normal. However, a great day was had nonetheless, and the presentations took place in calm sunshine. Winners in the gents’ York competition were: Trophy and BLBS silver medal – Allan Fleming, score of 50 hits, 196 score, 4 golds; highest score (BLBS bronze medal) – Doug Anderson 47, 179, 2; most golds (BLBS bronze medal) – Bill Campbell (Highland) 25, 113, 2 (after countback). Ladies’ double national competition: Trophy and BLBS silver medal – Barbara Campbell 96, 400, 6; highest score (BLBS bronze medal) –Elizabeth Normand 78, 302, 5; most golds BLBS bronze medal – Elaine Pearson 69, 291, 4. Juniors glass plaque – Kyle Fairbairn 62, 212, 2. A special mention goes to Shirley Brown, who did an outstanding job of serving teas and was Lady Paramount for the presentations. The Thursday Club held their annual trophy night in the newly-decorated Village Hall. Caitlin Jackson won the High School trophy, while Fiona Jackson and Brian McGowan won the adults’ final for the Kerr Trophy. Club secretary Audrey Rae would like to thank all the players for their support this season. Sunday sees the start of the Hawick Bowling Club season, with their opening picnic being held at 2pm. A large turnout of members is requested to support Bill Anderson, new president for the coming season. Kelso Wheelers’ time-trial season got under way with a five-mile pipe-opener to Birgham. There was a mixed bag of results, from six pbs and a course record to some slower than expected times. Oscar Onley continued his fine form of last season by taking a minute off his pb to set a new youths’ course record, while one of the most impressive rides of the night came from Gavin Ford, Gordon Dalglish and David Whitecross, who all took approximately three minutes off their pbs. Next week, the action moves to the opening round of the 10-mile league over the Birgham course. Times were: K. Darling 11.04; C. Stevenson 11.14; J. Smith 11.18; D. Burgher 11.20; R. Ure 11.38; S. Gaunt 11.43; M. Burgher 11.44; D. Richardson 12.04; I. McKenzie 12.10; J. Bader 12.11; L. Thomson 12.12; G. Ford 12.15 pb; O. Onley 12.33 pb and cr; R. Connell 12.48; K. Wilson 13.03; G. Dalglish 13.03 pb; D. Scott-Watson 13.14; G. Easson 13.25; A. 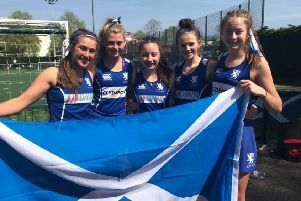 Power 13.29; D. Whitecross 13.53 pb; A. Ker 13.53 pb; G. Gauld 14.07; S. Onley 14.13; R. Smith 14.38; H. Graves 15.12; D. Small 15.21 pb; J. Sinton 15.44. Border Area pool of players to play Lothians at home on Saturday, April 25 – Men: A. Ballantyne, D. Bohme, B. Dalgleish, C. Donaldson, I. Graham, N. Forsyth, D. Gray, R. Hay, R. Hogarth, K. Inglis, R. Lackenby, C. Martin, D. McEwan, J. McGuigan, S. J. Patterson, C. Stewart, C. Waddell, K. Wright. Reserves:- G. Bell, H. Peat, G. Peters, K. Richardson, G. Scott. Women: K. Darling, I. Hogarth, N. Hogarth, H. Knight, A. Mitchell, J. Mitchell, J. Robertson, L. Scott, S. Smith, L. Virtue. Reserves: T. Condy, M. Middlemas. All women to be at KRBL for 10am, men at 11am. Rosebowl: 1, A. Simpson, K. W. Simpson, I. Gillie net 131; 2, K. C. Simpson, P. Dalgliesh, C. Forsyth 133. The next competition is the Bert Rankin, to be played on Saturday. John Scott (Plumbing & Heating) Seniors Championship qualifier: A League winner, H. Carruthers net 32; B. League winner, R. Brown 34 BIH. Free Membership Competition: 1, P. Richards 37 points; 2, J. Nagle 36; 3, C. Thomson 35. LGU Medal: 1, M. Forsythe 97 (23) 74 BIH; 2, K. Chapman 103 (29) 74; 3, P. Hogg 89 (14) 75. SLGA Medal: Winner, A. Fleming; Second, J. Brown; Scratch, F. Falconer; Nine-hole Medal, B. Robertson. Seniors’ Summer League: 1, M. White 38 points (after countback); 2, B. Whiteley 38; 3, J. Lunn 36. League positions: 1, M. White 16 points; 2=, D. Taylor, N. Simpson 14. Ladies’ nine-hole competition: 1, S. James 16 points; 2, F. Kerr 15; 3=, L. Bruce, M. Glendinning 13. Junior Mitchell Trophy: 1, R. Nichol 78 (21) 57 (lowest gross); 2, J. Flynn 78 (11) 67 (lowest gross); 3, C. Patterson 106 (38) 68 (after countback). Old Course Cup (Gents): 1, G. Morrison 81 (13) 68 (fter countback); 2, D. Wear 85 (17) 68 (after countback); 3, N. Simpson 92 (24) 68 (after countback). Ladies: 1, L. Towers 89 (13) 76 (after countback; 2, M. Towers 96 (20) 76 (after countback); 3, F. Kerr 97 (20) 77. Famous Grouse Foursomes: 1, J. Geatons & G. Thom net 71; 2, D. Whiteley & R. Johnston 72; 3, E. Berridge & D. Miller 72.5. Junior Order Of Merit (round one): 1, J. McDonald 92 (17) 75; 2, J. Grierson 93 (16) 77. Millennium Pairs Result: 1, B. Aitchison & A. Lawrie 64 BL3; 2, J. Temple & I. Clinkscale 64; 3, J. Kelly & I. Thomson 66. Linden took part in the inaugural Jed-Forest Junior Sevens at Riverside Park and, in the first tie of the day, got off to a dream start against the hosts. An interception by Conor Gracie resulted in a first-minute touchdown, converted by Phil MacTaggart. Jed hit back with a try, but Linden responded in kind from Scott Grant. Another Jed try made the half-time score 12-10 to the Teries. In the second period, the home side ran in three unanswered tries to complete a 27-12 win. In their second group game, Linden faced a Peebles team that had too much pace that led to a comprehensive 43-0 defeat. Langholm rugby club held its biennial dinner last Friday in the Milntown clubrooms and it was a most enjoyable evening with excellent speeches. President Michael Bell welcomed everyone and the Rev Scott McCarthy said grace. The Toast to Rugby was made by Peter Brown, former Gala, West of Scotland and Scotland player. Langholm chairman Kenneth Pool proposed the toast to the Scottish Rugby Union and the SRU president Ian Rankin replied. Eric Paxton, former Kelso and Scotland player, toasted Langholm RFC and secretary Catriona Bell replied. The toast to the guests was made by Davy Gordon and Charlie McCrearie of Hawick YM replied. Nicki Henderson and Charlie Graham played guitar and sang for the company. After round four of the SJ7’s Series, Jed Thistle have managed to make it three in a row, beating Kelso Quins in the final of Hawick Wanderers Sevens held at the Volunteer Park. The hosts were beaten by Kelso in the semis, giving the Tweedsiders their first appearance in a final this series. In the other semi, Selkirk Youth Club were defeated by the eventual winners. The club will mark the start of the 2015/2016 season by hosting an American tournament on the courts at Gibson Park on Sunday, April 19 (1pm for juniors and 2pm for seniors). This will be a social afternoon for players of all standards. It is an occasion when those looking to join a tennis club can come along to meet other members and find out more about the club. Melrose Waverley is a flourishing and inclusive club, which caters for all standards and ages, and the cost of joining is very reasonable. There are several sessions where ladies and men can play, both in the mornings and evenings. An enthusiastic group of seniors (over-70s ) play several times a week. There are also opportunities to play in the varied Border League matches and club championships. A programme for coaching juniors and seniors is also in place. The club has its own website – www.mwtc.co.uk/ and is also on social media – www.facebook.com/groups/269160853239293. You can also find information on the noticeboard at the clubhouse or by phoning the secretary, Pat Nicholson, on 01835 823924.